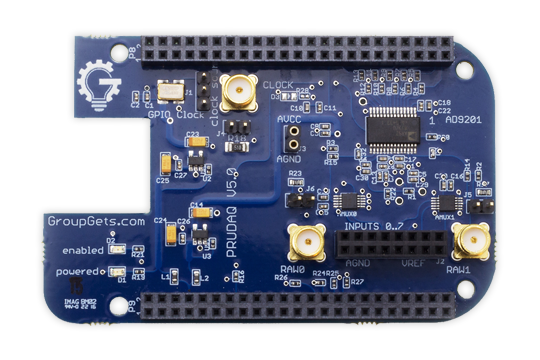 PRUDAQ is a fully open source 40MSPS Data Acquisition (DAQ) cape for the BeagleBone Black or Green designed by Jason Holt and his team at Google Research with a software collaboration from the BeagleLogic creator, Kumar Abhishek. For those who may not have all of the pieces in place to get started with PRUDAQ, we created this special starter bundle to quickly get sampling with. Please note that this is not an OFFICIAL Google product. Definitely visit Google's comprehensive PRUDAQ Wiki to get the full specifications and development guidance. Our PRUDAQ page also has more information and will continue to be updated. If you haven't seen the Google Research blog post by Jason Holt about the inspiration behind this board, we highly recommend it. 4:1 analog switches in front of each channel provide a total of 8 single-ended analog inputs. Included Samsung 64 GB USB 3.0 drive (MUF-64BB/AM) for storage of samples - battle-tested amongst many for best performance. The Google sample application software is not pre-installed. Users must download and install the latest PRUDAQ software from its GitHub Repo. The BeagleLogic application is however pre-installed on the micro SD card. This item and some of its accessories are available in the GroupGets Store with a shorter lead time. Get all of the pieces that you need in one place for this special low-cost yet high performance DAQ system powered by BeagleBone and open source. GroupGets is the only place to get PRUDAQ at this time. I have just created the GroupGet for PRUDAQ - 40MSPS DAQ BeagleBone Bundle (Round 5)!